People are always giving me crap about hoarding random things but then, when I convert those “things” into useful stuff and they’re all WHY DIDN’T YOU TELL ME? So, listen, I’m telling y’all now: save your produce bags. 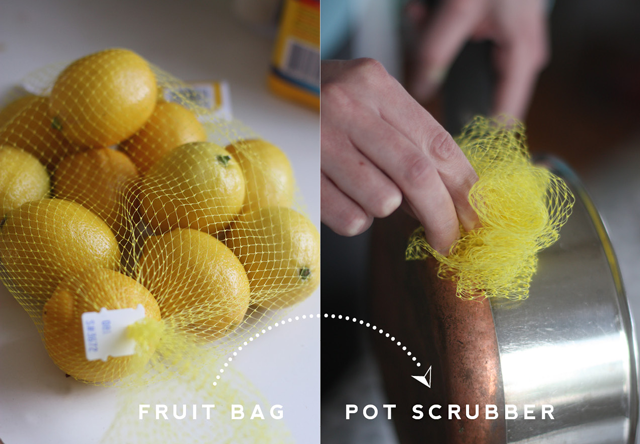 The plastic mesh ones that are used to bind up lemons and oranges and onions. Clip the edges, pinch it into a bunch, and bind it with a zip tie. No zip ties around the house? 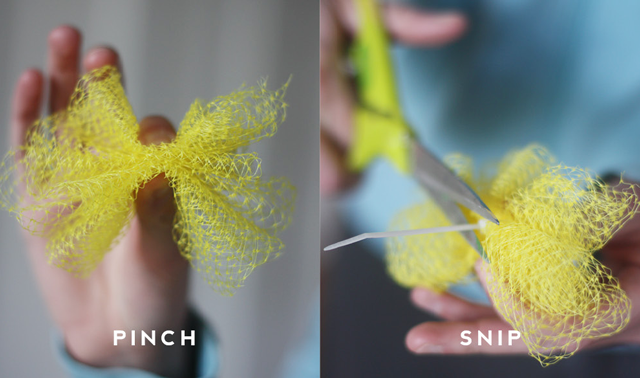 Use one of those little wire twist ties from the produce section and peel off the paper. Presto! These babies are THE BEST thing for scrubbing pots — more aggressive than any sponge but less abrasive than brushes or steel wool. I like to keep one specifically for the floor too — they are great at scraping off any stuck-on bits. Nifty huh? So very nifty! And I love your beautiful lemony-gray photos of the thing! My place was fine….two houses over was a problem. Their property is almost concave in the the back. Lots of damage. Knock on wood we can dry out before another round of rain like that! Um, is it wrong that I thought the direction you were going was “hair piece.” Hair piece that can scrub like no one’s business? Peaches, I keep one of those on the bathroom sink! When my hands are covered with paint or glue or dirt, I squirt some soap on my vegetable bag scrubbie and scrub away. Works like a charm. You have the best tips! Hi. I use a little bit of the mash in the bottom of plant pots, so the dirt cant go out, but the water can. And sometimes if I don’t have any I use egg shells.